As if earthquakes, tsunamis, nuclear meltdowns and war was not enough, the Examiner now discloses that a replay of the BP oil spill could be in the making. The U.S. Coast Guard is currently investigating reports of a potentially massive oil sheen about 20 miles away from the site of the Deepwater Horizon oil rig explosion last April. 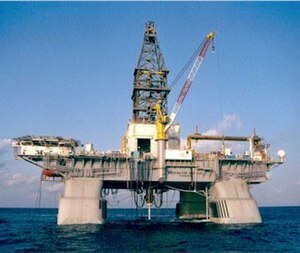 There are no definitive reports yet, but we should know for sure within hours, if the Keppel FELS built TLP is indeed the culprit: "According to Paul Barnard, operations controller for the USCG in Louisiana, a helicopter crew has been dispatched to the site of the Matterhorn SeaStar oil rig, owned by W&T Offshore, Inc." Multiple reports have come in of a sheen nearly 100 miles long and 10 miles wide originating near the site. According to W&T, the field has produced an average rate of 5,200 barrels of oil per day, and has production capacities of 35,000 barrels of oil per day.